Order your own copy of the Legend of the Five Rings Roleplaying Core Rulebook at your local retailer or online through our website today! The Emerald Empire stretches out before you—a land of honor and tradition, divided by the seven Great Clans and united under the rule of the Emperor. Whether you’re caught in a web of intrigue and lies at the Emperor’s Winter Court, investigating the murder of a prominent official, or battling against the encroaching Shadowlands, the world of Legend of the Five Rings is full of adventures. And now, you can embark on those adventures for yourself. The Legend of the Five Rings Roleplaying Core Rulebook is now available, giving you everything that you need to create your own characters, forge an adventure, and start roleplaying in the Emerald Empire. The Core Rulebook isn’t releasing on its own, however. Even the most skillful samurai still need to pass skill checks, and the Legend of the Five Rings Roleplaying Dice Pack gives you the ring dice and skill dice you need to play. Finally, the Game Master’s Kit offers an invaluable accessory for Game Masters, complete with a deluxe screen and a pre-written adventure to jumpstart your journeys into Rokugan. You can pick up the Legend of the Five Rings Roleplaying Core Rulebook, Dice Pack, and Game Master’s Kit at your local retailer or online through our webstore today! 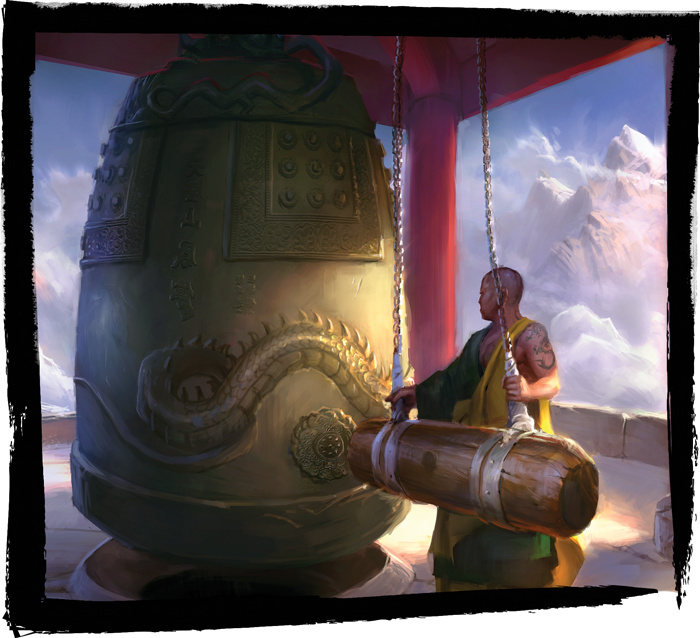 And be sure to check out the player resources for Legend of the Five Rings Roleplaying in the support section of our minisite, including blank campaign sheets, character sheets, the Game of Twenty Questions, and brand-new DLC content focusing on the Mantis Clan. Even if you’ve already gotten your first taste of Legend of the Five Rings Roleplaying through the Beginner Game, there’s plenty more to explore and enjoy within the Core Rulebook. For starters, you aren’t confined to pre-generated characters. With the Game of Twenty Questions, you can create your own samurai in the world of Rokugan—an individual just as unique as you. In our previews, we took a closer look at character creation through the Game of Twenty Questions, from selecting your clan and your family to choosing a school for your character and carefully picking advantages and disadvantages. With dozens of schools to choose from, all featuring unique abilities, you can create the perfect samurai for you to play—whether you’d prefer to be a silver-tongued courtier, a wandering monk, or a deadly bushi. 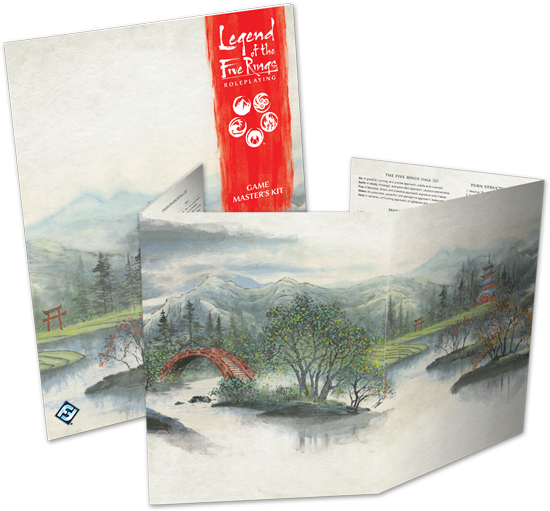 We looked beyond simply character creation, however, to explore the wealth of other options for customization included in the Legend of the Five Rings Roleplaying Core Rulebook. You may select powerful techniques to give you an edge in your encounters, whether those techniques fall under kata, invocations, kihō, rituals, shuji, mahō, or ninjutsu. We also looked closer at the assortment of non-player characters included in the Core Rulebook, giving the Game Master a full assortment of potential allies or enemies to throw at the players. With a full chapter of advice for Game Masters on running roleplaying games (and particularly, roleplaying games in Rokguan! ), even first-time Game Masters will have no problem picking up the book and leading their party into their first adventure in the world of Rokugan. Finally, we also had insights from designer Max Brooke along the way, looking at the genesis of the unique roll-and-keep dice system that’s used in Legend of the Five Rings Roleplaying. These narrative-focused skill tests open a wealth of opportunities for you to play out stories on the tabletop, but they can also introduce more strife to your character. In Max’s second preview, he looked closer at strife and the ways that samurai can struggle and change under the constant pressures of their society and the Code of Bushidō. Whether you got started with the Beginner Game or you’re new to Legend of the Five Rings Roleplaying, you can find your next steps laid out before you with the Core Rulebook, the Dice Pack, and the Game Master’s Kit. Become a samurai and start your adventures in Rokugan today! 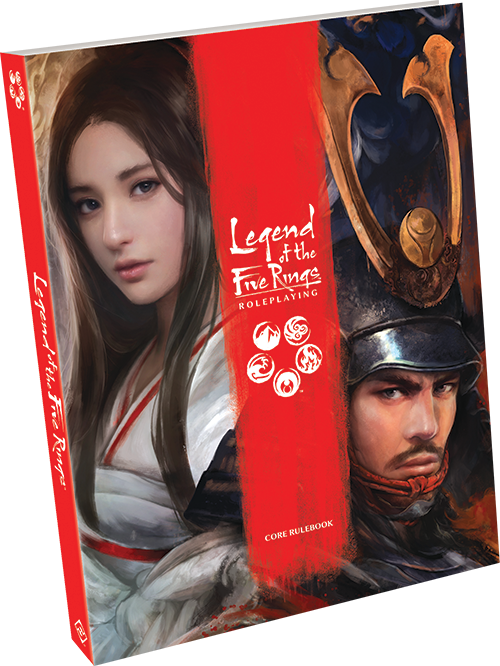 You can pick up your own copy of the Legend of the Five Rings Roleplaying Core Rulebook (L5R02), Dice Pack, (L5R03), and Game Master’s Kit (L5R05) at your local retailer or online through our webstore today.